Image caption A reader of the Henley Standard said prefacing readers' letters with "Sir" was "a ridiculous and offensive tradition"
A local newspaper has removed "Sir" from its letters pages after a reader called it a "ridiculous and offensive tradition". Liz Hatch wrote to the Henley Standard in Oxfordshire, disputing the need to preface "all letters to the editor with 'Sir'". She said other papers had "eradicated this sexist attitude". Editor Simon Bradshaw said although other newspapers still used "Sir", the paper would drop the preface. In Friday's letter section Ms Hatch, of Henley, wrote: "While I am by no means a feminist, I can't believe it is necessary to maintain such a practice when other papers have eradicated this sexist attitude." She argued that readers of the newspaper probably did not know the gender of the editor and questioned whether it was relevant. She ended: "Please bring your paper into the modern era and join the ranks of other papers which have removed such a ridiculous and offensive tradition." Responding, Mr Bradshaw said he "had not appreciated that it was causing offence" and the paper, which was founded in 1885, was merely sticking to convention, "as have the [Daily] Telegraph and Private Eye". He added that the use of "Sir" always seemed appropriate, "especially as I am male!". He said many of the letters received were from "regular contributors" who would know who they were addressing. 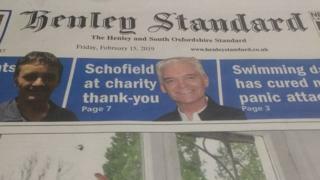 Image caption The Henley Standard said several newspapers continued to follow the convention of adding the preface "Sir"
But he added: "In the interests of causing as little offence as possible, from next week we will drop 'Sir' and I would ask others readers to please note this." Many national newspapers have ended the convention of beginning letters from readers with "Sir". The Guardian, Daily Mail, Daily Express, and the Sun do not use any preface. The Daily Telegraph still introduces letters with "Sir", as does the Times. In 2016 city law firm Freshfields Bruckhaus Deringer became one of the first "magic circle" firms to become gender neutral, addressing communications to "Dear Sir or Madam".